Look! It's a United Colors of Beneton ad! 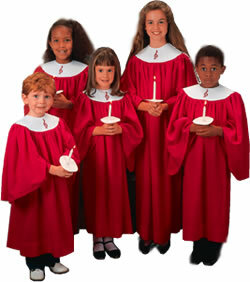 For choir robes! It’s been Christmas at our house since May. And no, we’re not those losers who keep their Christmas lights up until April; well, not ever since my husband threatened to ban any and all holiday decorating if I didn’t get the decorations put away in a timely manner. It is kind of my fault that the jack ‘o lantern sat on the porch until it rotted into a scrape-upable puddle sometime in mid-November, but that was years ago and I’ve changed my ways. No, my daughter has a thing for Christmas carols, so the house, the car, her bedroom, all of it, are currently well-stocked with Christmas CDs in every musical device. Whenever her sister practices piano, our youngest tax-break will undoubtedly come into the room and demand a rousing rendition of “Jingle Bells.” It doesn’t matter that she’s wearing her swimsuit and is on the way to the pool. HIM: You know how our kid is pretty good-sized? ME: Is that a fat joke? HIM: No, it’s an age joke. ME: Is there something funny I don’t know about? HIM: Anyway, I was just wondering something. Don’t get mad. ME: You know I’m going to get mad if you have to tell me not to before you even speak. HIM: Really, I’m just curious about this. (dramatic pause) Is it even a little bit possible that she can’t talk because she doesn’t know English? ME: (more blank staring) (followed by a deep cleansing breath) Honey, remember when I gave birth to her and you couldn’t look because it was really gross? ME: We weren’t in Portugal. We were in Alabama when that happened. ME: So that means she would talk like anybody else in Alabama. We’re not Portuguese, ergo, we don’t speak Portuguese. ME: Kids speak whatever language the people around them speak. (slowing the words down because he still looks confused) There’s no way she speaks Portuguese. ← How Come I’m Not The Incredible Hulk? You really need to be a sitcom writer! Your stuff is way more entertaining than what’s out there. Awww, thanks! Sadly, this stuff is all from my day-to-day life, so unless I want to be on a show about a middle aged cautionary tale working two jobs to support her Godiva habit…never mind, who would believe it? Lorca, I loved your post. It was witty, urbane and fun. I am glad that you can find humor in the mundane and the issues related to a child who is diagnosed with autism. It can be difficult to maintain balance at times. Thanks for sharing a window into your world. Well, I’ve always known it’s laugh or cry, and crying doesn’t go well with alcohol. Might as well laugh! Actually the Catholics in her life taught it to her secretly. Its a nice song! I secretly like Christmas carols too–except when they are done by those really irritating dogs that bark to the tune or mechanical toys that dance spasmodically in rhythm. Let’s see how long you love them when you’re hearing them in June! The great thing about Christmas is the looking forward to it part. When it never goes away, it gets a little old.